Do you remember me showing you these? received them so I can share with you. and make her a Table Runner. very pleased with how it has turned out. It is the first time I have done a scrappy binding and I love how it looks. I choose to use some "Paper Dolls" clothing fabric for the back. put in a little notepad, a Craft Keeper for ribbon or thread and some Charm Squares. And with a beautiful email like this it makes swaps, fun and rewarding. Sharon I got your super sweet package. I was at awwwww when I opened it. The little quilt you made is gorgeous I just love it in all it's vintage fabric glory. Thank you again Cheryl for organising these swaps. I can see why Donna was so happy with her parcel it is beautiful, the little extras are very sweet too. 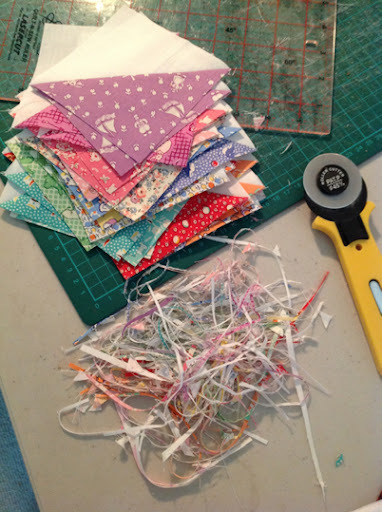 The scrappy binding looks fabulous. That binding is awesome. :) This is a very pretty mini quilt. The table runner looks gorgeous, as are the roses in that vase! Your runner is beautiful Sharon. I can see why Donna was so thrilled to receive it. I love the table runner Sharon. Gorgeous colours. What a lovely swap parcel to receive. You sent a lovely gift Sharon. I love the scrappy binding. As always sharon, your sewing is beautiful.